Chhath is a festival of reverence to the solar deity, the only festival in the world where devotees offer salutations to the setting and rising Sun. The word Chhath denotes the number six and thus the name itself serves as a reminder of this auspicious day on the festival calendar. The festival of Chhath is widely observed in eastern India. This is a festival where worship of God Sun is performed. It may be noted that Sun’s worship is not done at many places. This festival is one of the most difficult to observe and is done to thank Surya or Sun for sustaining life on earth. 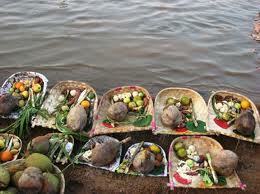 There are some incidents where it is believed that Chhath was observed by Lord Rama, Draupadi and Karna. In Indian mythology, the worship of Sun god is believed to be beneficial and capable of curing diseases. The process of observing this festival is very rigorous. This festival is spanned across four days. Almost immediately after the merriment of Diwali subsides, the solemnity of Chhath takes over. Women of the household make various preparations puja. While the younger women and children take over the everyday household chores. These women begin with a thorough spring-cleaning of all the things that would be used to prepare the prasad or food offerings to Sun god. Everything, from the kitchen chulha to the ladles, cooking utensils, and frying pan, is purified. It is the bounty of the harvest, which is deemed a fit offering to Sun god. Newly pounded rice is soaked and made into a paste. Dry fruits, nuts and slivers of coconut are used as flavoring and the cooked lump is then rolled in the palms and then they are fried. Chhath is a festival of prayer and purity observed with somberness and strict discipline, a festival that should not be missed. It is held in high esteem and regard. On the day before the actual worship, devotees take a cleansing dip, preferably in the Ganges, and bring back some holy water to prepare the offerings. A fast is observed for the whole day and late in the evening, the devotees, after performing worship at home, break their fast. The offerings – typically a rice porridge, Sohari/puris (deep fried puffs of wheat flour) and bananas – are shared among family and visiting friends and relatives. Fast or Upvaas (fasting) begins on the second day and this is referred as Kharna. On Panchami, the day before Chhath, the Vrati observes fast for the whole day, which ends in the evening a little late after sunset. Just after the worship the offerings of Rasiao-kheer (rice delicacy), Sohari/puris (deep-fried puffs of wheat flour) and bananas are offered to deities and then the whole family shares the Prasad. Offerings are made to the setting Sun. 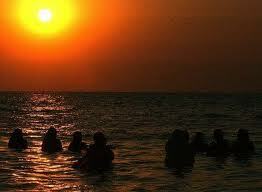 Chhath is the only festival when the setting sun is worshipped. This signifies Indian culture where Sun is respected despite on decline. 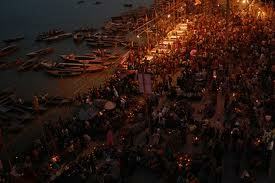 The devotees reach the riverbank again just before the sunrise, and offer prayers to the rising Sun. Once the prayers are done, the devotees break their fast with the Prasad or the offerings. This culminates this festival. The devotee follows very strict rituals during this festival and the whole family supports the observer, also called as Parvaiti or Parvaitin. This festival is observed most elaborately in Bihar, Eastern Uttar Pradesh, Jharkhand and the Terai regions of Nepal in modern times, and is more prevalent in areas where migrants from those areas have a presence, it is celebrated in all regions and major urban centers in India. The festival is celebrated in the regions including but not exclusive to the northeast region of India, Madhya Pradesh, Chhattisgarh, Chandigarh, Gujarat, Delhi, Mumbai and Mauritius. It is believed that Chhath was started by Karna, the son of Surya Putra. Karna, who ruled over the Anga Desh (present day Munger district of Bihar) during the Mahabharat Age. He was a great warrior and danveer and fought against the Pandavas in the Kurukshetra War. The ancient Sanskrit epic Mahabharat has references to Draupadi, worshipping Sun. In the epic, Draupadi, the wife of the Pandavas, rulers of Hastinapur (modern Delhi) had performed the Chhatha-Vrata, seeing the Pandavas in deep trouble and on advice of noble sage Dhaumya. Through her worship of Sun god, Draupadi was not only able to solve her immediate problem but also helped the Pandavas later regain their lost kingdom.